A 32-year-old female patient reported to the dental hospital with a complaint of growth in the left lower jaw since 1-month. History revealed the growth was rapidly growing in size, associated with pain, and numbness the mandible on the affected side. The patient's medical, dental, personal, and family histories was noncontributory. On examination, a single diffuse swelling was seen on the left body, and ramus of the mandible measuring 4 cm × 2 cm in size, [Figure 1] and [Figure 2] bony hard and mildly tender on palpation. Intraoral examination revealed an exophytic growth obliterating the gingivobuccal sulcus in relation to 37 regions, hemorrhagic, a soft in consistency, slightly tender on palpation with the expansion of the alveolar ridges [Figure 3]. Correlating the history and clinical features, a provisional diagnosis of aggressive bony neoplasm was made. The periapical radiograph revealed a well-defined radiolucency in relation to 35, 37. The mandibular lateral occlusal radiograph revealed a well-defined radiolucent lesion with the expansion of the buccal cortex. 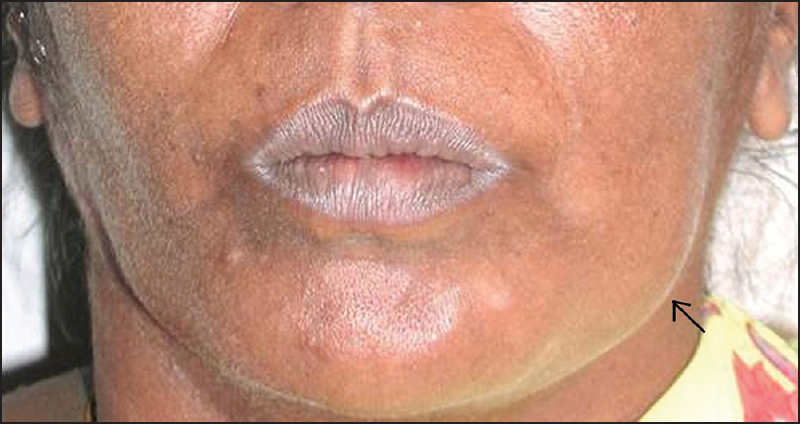 Lateral oblique view of the body of left mandible showed a well-defined multilocular radiolucency in the mandible. 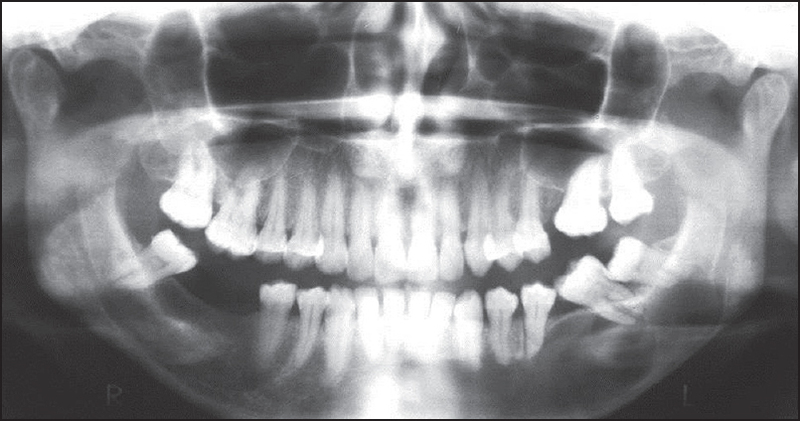 A panoramic radiograph revealed a well-defined multilocular radiolucency in the left body-ramus of the mandible [Figure 4]. 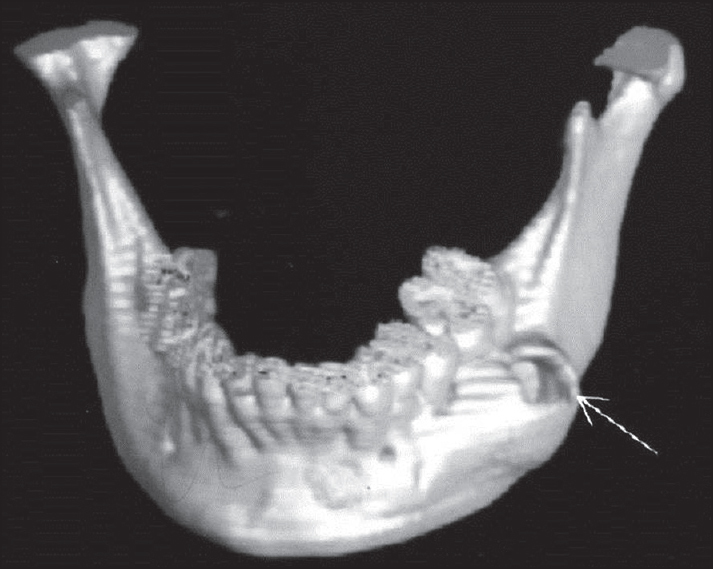 Computed tomography scan of the mandible revealed an expansile lytic lesion in the left mandible body and ramus of the mandible with cortical perforation buccally [Figure 5] and [Figure 6]. Serum calcium, phosphorous, and parathyroid hormone assay were in normal limits. The differential diagnosis was listed based on the clinic-radiologic manifestations, included ameloblastoma, odontogenic myxoma, CGCG, central hemangioma, aneurysmal bone cyst, and brown tumor of hyperparathyroidism. Incision biopsy revealed fibrous connective tissue stroma containing numerous multinucleated giant cells [Figure 7]a. The multinucleated giant cells are of the osteoclastic type containing >10 nuclei [Figure 7]b. Areas of osteoid formation [Figure 7]c, mild chronic inflammatory cell infiltrate, moderate vascularity, and hemorrhage are evident [Figure 7]d.
Hemimandibulectomy of the left side was performed followed by surgical reconstruction. The patient was followed up after 6 months, and postoperative check-up revealed no recurrence. Giant cell lesions of the maxillofacial region generally present as an asymptomatic slowly growing lesion to aggressive neoplasm like rapid expansive progression characterized by root resorption and pain and associated with recurrence after treatment. Department of Oral Medicine and Radiology, Saveetha Dental College and Hospitals, Chennai, Tamil Nadu. 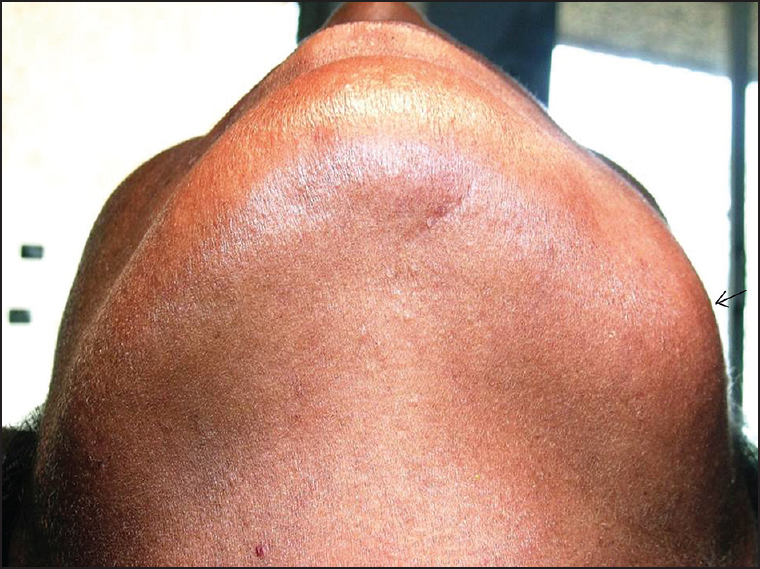 Shah UA, Shah AK, Kumar S. Giant cell reparative granuloma of the jaw: A case report. Indian J Radiol Imaging 2006;16:677-8. Güngörmüs M, Akgül HM. 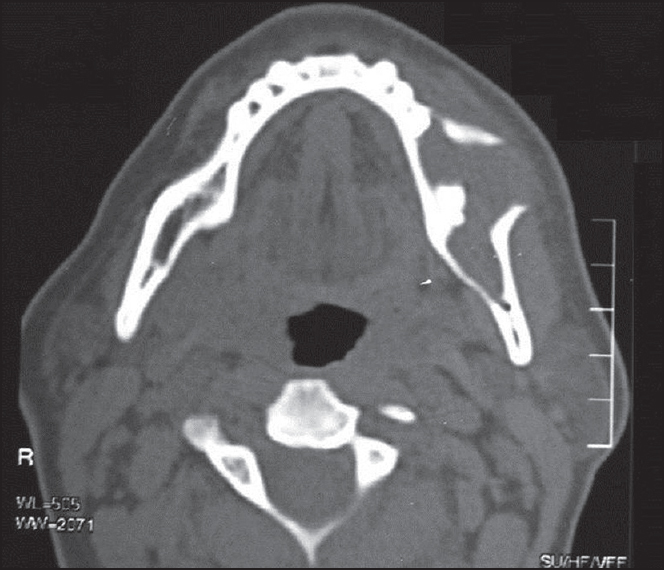 Central giant cell granuloma of the jaws: A clinical and radiologic study. J Contemp Dent Pract 2003;4: 87-97. Barnes L, Everson JW, Reichart P. WHO Classification of Tumours. Pathology and Genetics of Head and Neck Tumours. Lyon: IARC Press; 2005. p. 324-5. Wood NK, Goaz PW. Differential Diagnosis of Oral Lesions. 5 th ed. St. Louis: Mosby; 2007. p. 393-5. De Lange J, Van den Akker HP. Clinical and radiological features of central giant-cell lesions of the jaw. Oral Surg Oral Med Oral Pathol Oral Radiol Endod 2005;99:464-70. Chuong R, Kaban LB, Kozakewich H, Perez-Atayde A. Central giant cell lesions of the jaws: A clinicopathologic study. J Oral Maxillofac Surg 1986;44:708-13. Murphey MD, Nomikos GC, Flemming DJ, Gannon FH, Temple HT, Kransdorf MJ. From the archives of AFIP. Imaging of giant cell tumor and giant cell reparative granuloma of bone: Radiologic-pathologic correlation. Radiographics 2001;21:1283-309. Miyamoto N, Higuchi Y, Tajima M, Ito M, Tsurudome M, Nishio M, et al. Spindle-shaped cells derived from giant-cell tumor of bone support differentiation of blood monocytes to osteoclast-like cells. J Orthop Res 2000;18:647-54. Ustündag E, Iseri M, Keskin G, Müezzinoglu B. Central giant cell granuloma. Int J Pediatr Otorhinolaryngol 2002;65:143-6. 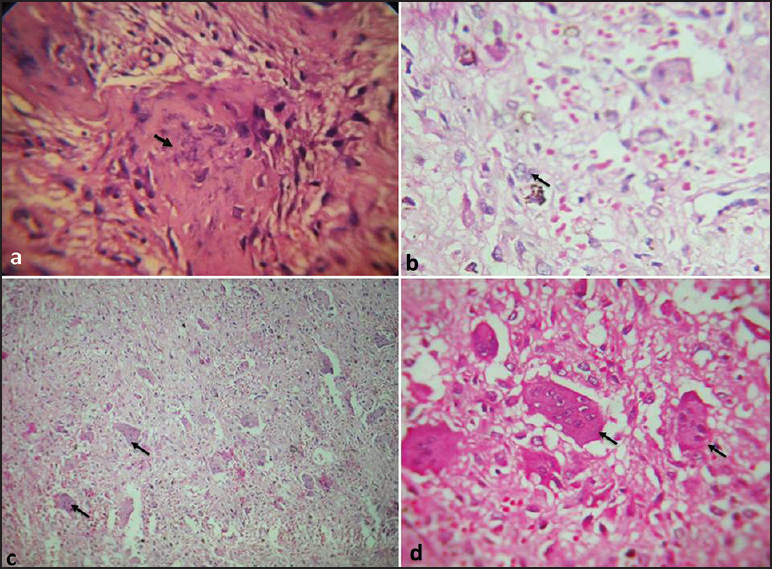 Ebrahimi H, Yazdani J, Pourshahidi S, Esmaeli F, Zenouz AT, Mehdipour M. Central giant cell granuloma of the posterior maxilla: A case report. J Dent Res Dent Clin Dent Prospects 2008;2:71-5. Infante Cossío P, Martínez de Fuentes R, Carranza Carranza A, Torres Lagares D, Gutiérrez Pérez JL. 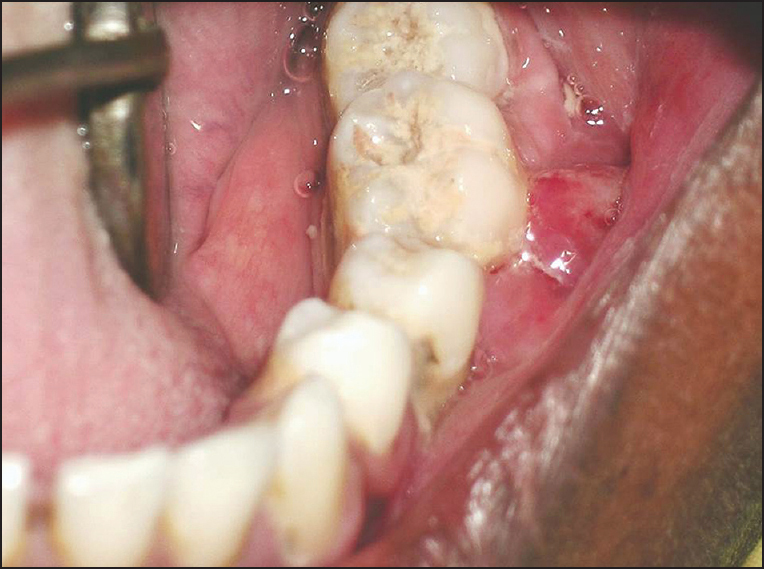 Recurrent central giant cell granuloma in the mandible: Surgical treatment and dental implant restoration. Med Oral Patol Oral Cir Bucal 2007;12:E229-32. Kaban LB, Troulis MJ, Ebb D, August M, Hornicek FJ, Dodson TB. Antiangiogenic therapy with interferon alpha for giant cell lesions of the jaws. J Oral Maxillofac Surg 2002;60:1103-11. Harris M. Central giant cell granulomas of the jaws regress with calcitonin therapy. Br J Oral Maxillofac Surg 1993;31:89-94.